RUSH: Todd in Grand Island, New York. It’s great to have you on the program. You’re next, sir. How’s it going? CALLER: What an honor to speak to you. Thank you so much for everything you’ve done. CALLER: For everything you do. CALLER: I had to get right to my point in reference to the 2018 elections. You made a point saying that if the Democrats win 3% of what Donald Trump — in the margin of 3% error if Donald Trump (unintelligible) and the Democrats win those seats, and also if they win the seats that Hillary would have won and we gave them all them (speaking too fast, unintelligible) they’d still lose six seats total. I fear that even if this is prior to Trump running out stadiums and making rallies against the Republicans, I feel that the voters are not gonna vote for the existing Republicans which are rerunning for reelection, and we may lose those seats. RUSH: We started talking about this yesterday, and I’m glad you called, because you have served here as a reminder for me. I pledged to finish this discussion. The Republican Party, folks, is cracking up. It’s amazing. It appears to be on purpose. Now, let’s walk through this. You know the drill. The Republican Party — let’s go back to the days — Obama gets elected in 2008, and Republicans and conservatives all over the country are in a deep depression or panic because they know we know what Obama’s intentions are. We know that he’s gonna nationalize health care. We know that he is going to weaken the United States militarily. We know because he said so, that he’s going to transform America. We know that he believes America is not a place of exceptionalism, and we know that he doesn’t think America is great. We know that he thinks America is guilty. We know that he believes that America needs to be cut down to size or to pay a price for all of these injustices, and we’re seeing the outgrowth of that now. What do you think Antifa is? Antifa is Obama as violence, Obamaism as violence. Antifa is no different in terms of what their beliefs are than what Obama’s beliefs are. Now have that may offend some of you, but I’m telling you, be courageous and don’t doubt me here. Where do you think these groups come from? Who do these groups vote for? It’s Democrats that they vote for. This Antifa group is no Trump, no USA, no this, no that, these people are totally opposed. They believe the United States was guilty from the first days of our independence, founding, and what have you. They’ve been taught this. They’ve been taught this by the same people that probably taught Obama, that taught all these other Democrats and leftists and have taught people in the media. Anyway, in 2008 we knew that’s what was in store for us. It was shocking, it was chilling, it was a wake-up call. And something else we were shocked by. We were shocked by how little time it took for it to appear that we had lost our country to people on the left. All during the Bush years, Republicans in power, the left was there, but with the election of Obama and his ascension to office, it looked like we’d lost the country overnight. So here comes Obamacare, and everybody’s worst fears are realized, and so the Tea Party springs into action organically. No leader; there’s no charter; there’s nobody who made this happen. It was a bubbling up effervescence of average, ordinary Americans, many of whom had never been involved in politics before. And they get busy. It scares the hell out of Democrats and Republicans. It scares the hell out of them because it’s real citizens who are not the result of money or fundraising or donations. And they are active and engaged, many in their case for the first time in their lives. The Democrats are so panicked by it, they create an artificial response to it called Occupy Wall Street. The way the Republicans react to it, start lying to ’em. “Yes, we agree. Repeal and replace Obamacare. We’re gonna stop this spending.” The Republicans said everything they needed to say to get the votes of the Tea Party and Republicans in 2010, and they did. And so the Republicans win back the House. And we immediately start hearing they’re gonna repeal and replace Obamacare, they’re gonna stop this spending, no more debt limit expansion, all of this! But they never do it. It never happens. And we get excuses. “Well, we really want to, but we can’t do anything until we have the Senate.” So, a few years later, Republican voters gave the Republican Party the Senate! And we thought now we’ve got a way to stop Obama! But it turns out the Republicans said no. We don’t have enough votes to stop Obama. We really can’t repeal and replace Obamacare. We can’t do anything about spending, and we can’t cut taxes or any of this stuff until we have the White House. And the Republicans never expected to win the White House. I don’t care what you were told, I’m telling you that Republicans in the establishment, inside the Beltway, never thought — I don’t care, Romney wasn’t gonna win, whoever — Jeb Bush, they didn’t think was gonna win, it was all about getting a nomination and establishing the order for the Republicans within the establishment. But nobody expected to beat Hillary. They were scared to death of her. There isn’t a Republican in that town that thought they were gonna win the presidency. And they did. Trump did. But yet they offered more excuses. You know what the new one is? We don’t have 60 votes in the Senate so we really can’t do anything. Now, folks, after seven or eight years of the Republican Party promising every election to do everything Republican voters expect and promising to do these things, Republicans didn’t not promise, they did. They were gonna get rid of Obamacare, replace it, do something. They were gonna cut taxes, gonna stop this spending, and we were going to get control of the border. If nothing else, we were gonna put a stop to so much illegal immigration. And none of it, even with a Republican, Trump in the White House, none of it has happened. Now, this can’t go on. The caller’s point is who in the world is gonna vote for Republicans anymore after this? But if they don’t, and if Trump ends up a lone Republican from 2019 through 2020 and the Democrats, say, have control of the House, which, by the way, isn’t gonna happen. Whatever you think of the Republicans, the Democrats are in a much, much bigger mess when it comes to winning elections. And I know things can change and change on a dime. But the Democrats are not part of this discussion. It is an interesting question: What happens when the president of the United States is a Republican and the rest of his party is doing everything it can to undermine him and his agenda? What happens? What’s in the minds of Republican members of the House and Senate? After two years of openly opposing Trump, openly thwarting. After seven years of promises and now the chance to do it all, the Republicans have a chance to do everything they said they were gonna do, they control Washington, electorally. “But, Rush, but, Rush, they don’t have 60.” I know, I know, eight Democrats in the Senate can bottle it up. But they haven’t gotten one thing done legislatively. Tax cuts. The Democrats can’t stop them. Folks, they have an opportunity to do everything they have been promising to do, a once-in-a-career opportunity. They’re never going to have this kind of power. And what are they doing? Nothing. In fact, it’s worse than nothing. It appears to outsiders that they are part of the effort to thwart and stop Trump. Do they think this behavior is gonna be rewarded with reelection? Do they think that the American voters are gonna blame all of this on Trump and reelect Republicans and try to get rid of Trump? And what does Trump do when it comes time to run for reelection? Does he run as a Republican or does he say, “This party isn’t gonna exist! This party is killing itself. This party’s eating itself. This party’s committing suicide. I’m not gonna be a part of it.” There are a lot of questions here, the answers to which are open ended. 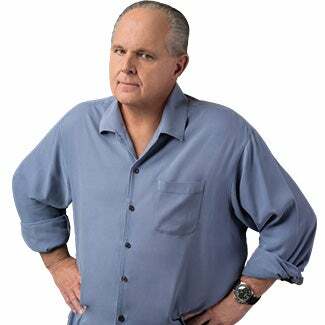 RUSH: You know, the Republicans are not gonna be able to hide. You look at the GDP number out today, revised upward now to 3%. This is the growth of the U.S. economy in seven months. Obama never saw this in eight years. The unemployment numbers are moving in the right direction with real jobs being created. Obama never saw this in eight years, and we’re seeing it in seven months. You want to talk about empathy. How about attitude? Look at the numbers of illegal immigrants not even trying to get into the country today simply because Trump and his administration have put the clamps down and are simply enforcing existing law. Here’s Reuters: “The U.S. economy grew faster than initially thought in the second quarter, notching its quickest pace in more than two years.” It’s more than eight years, Reuters. I mean, the news on balance, economically and otherwise is far better day to day, attitudinally, than it was under seven years, eight years of Obama. And all of this effort the Republicans are putting in to thwart Trump. And it’s not just to thwart Trump. I mean, as we’ve discussed, it’s the establishment circling the wagons and really protecting itself against an outsider. They simply can’t allow an outsider to succeed. But they’re not gonna be able to stop. Because whether they know it or not, the establishment doesn’t control the behavior of 99% of the population. They want to. They want to be able to control it. But they don’t yet. So it’s gonna be a conundrum, a multifaceted dilemma for these Republicans as to what to do. But it does portend interesting questions for Trump. I mean, he’s sitting up there and he’s not an idiot. He can see that the Republican Party is his primary obstacle. He knows this. It’s not the Democrats. The Democrats are doing what they would be expected to do. The Democrats are expected to try to stop Trump. The Democrats are expected to do whatever they can. What’s unexpected is for them to be joined by Republicans. So what does he do? Does he remain a Republican? Does he go independent? Does he come up with the Trump Party? And then what happens to disaffected Republicans who might want to also leave the party? Who knows what’s gonna happen. But there are some things going on that we haven’t seen in our lifetimes politically. Open-ended questions. RUSH: Have you seen the preelection polling down in Arizona? Jeff Flake is being swamped by his primary challenger, Kelli Ward. She has a 25-point lead. Still a year to go in this election, but it’s a harbinger, a big time harbinger. RUSH: That’s one of the reasons why the Drive-Bys are so focused on separating Trump supporters from Trump. That is their objective. That’s one of their many. I mean, their real objective is to get Trump out of office any way possible. If they could get him out of office by forcing him to quit in frustration, impeachment, what have you, they’d do it. But short of that, they’re doing everything they can, and they have been since get to go, to try to convince Trump voters that they made a mistake. That Trump is an embarrassment. That Trump lied to them, that Trump’s whatever. Because if they can do that, or if they can make Republicans think that Trump voters are going soft and abandoning him, the Republicans will be encouraged to continue to stop Trump. The Republicans have rolled their dice. They’re not going to help the Trump agenda. Now, there’s some overlap with Trump’s agenda and these Republicans, and one of those areas of overlap is tax cuts, tax reform. This is a signature and identity issue with the Republican Party. And if the Republicans, if Trump comes up — and he’s going to Springfield today to introduce the plan, and if it contains elements of tax reform, tax cut policy that the Republican Party has always supported, they’re gonna be hard-pressed to not join this. The challenge for the Republicans is they’ve got a lot of masters here: you, voters; they have their donors, which is the biggest master; and then they’ve got Trump supporters. Say Trump, in this case, comes out with a tax reform proposal that a majority of Republicans in Congress like, it’s gonna be a real dilemma for ’em. Because the last thing they want is for — believe me on this. And not all. I mean, you’ve got the Freedom Caucus in there in the House, you’ve got some conservative members there. But not all Republicans. And you’ve got some conservatives in the Senate. But for the most part, the party itself — not the RNC — but the party itself really doesn’t want Trump to succeed. Now, I know that sounds strange, but it isn’t when you realize that everybody is part of the establishment, and that membership comes first. And then your party affiliation is second. And if Trump — I think should have done this first. I think Trump should have done tax reform first and forced the Republicans to support him. Health care. I know, they made some tactical decisions and employed some various strategies, didn’t work out, and it’s too late to go back and redo it. The point is, with tax policy here, tax reform or tax cuts, the Republicans are gonna be hard-pressed to not help. Now, don’t put it past ’em to not join the effort. I mean, that has been the basic operation up to now. They’ve just gone through the motions. They haven’t really been serious about repealing Obamacare. You can’t tell me they have. And they’re not serious about getting in check with spending. And immigration, you know damn well that the Republicans want to go along with the Democrats for amnesty if they had their druthers. But when it comes to tax policy, signature Republican issue, particularly on the tax cuts for corporate side, you know, the corporate tax rate and the middle class tax cut, if Trump comes along and proposes something strong, the Republicans are gonna be hard-pressed not to join that. And if they don’t, they’re creating more problems for themselves than they can possibly imagine. They’re just literally throwing away a signature issue, an issue that has defined them and set them apart from the Democrats. And if they throw that away because they decide “Whatever we do, we can’t let Trump succeed ’cause he’s an outsider. We can’t have an outsider come in here and show that an outsider can do it better than we can,” it’s gonna be very interesting to see. RUSH: So, again, there’s gonna be some overlap here. Trump is going to propose some things that the Republican Party stands for. This is tough to say because it’s not universally true of all of them. But there are some of them, folks, that are just like Democrats who do not want Trump to succeed no matter what. So the balancing act, he proposes something that’s a signature issue of theirs. What do they do? It’ll be interesting to see. I think they can do both. I think they can sound enthusiastic, they can say, “Wow, this is great. We’re all for this,” and then stall the effort in Congress. Now, they gotta be careful about that, ’cause they run Congress. So if they start taking all these recesses. “Well, you know, we gotta go back home and campaign. There’s an election year next year. We got the Halloween recess. We’ve got the Yom Kippur recess. We got the Thanksgiving recess, the Christmas recess. Not many working days.” If they try that, not going to fly. And they better be paying attention to what’s going on in Arizona. Jeff Flake, who wrote this op-ed basically trashing Trump, has an opponent, Kelli Ward. This is the woman that ran against McCain and came up a little bit short. Jeff Flake has just 21% of support from Arizona Republicans for reelection against Dr. Kelli Ward. She’s coming in at 47%. This is a poll from JMC Analytics. It was a survey of 500 Arizona Republican voters. When you’re down 25 points, this is characterized as being an almost irreparable shape. So Trump has his rally in Arizona, where, what, 19,000 people, some inside, some outside, and there was a headline out there, “Flake Tries to Make Nice with Trump.” That was in The Politico. And we know why. ‘Cause he’s in dire straits here running up against Dr. Ward. Probably has seen these poll numbers. Flake thought that he was endearing himself. Flake’s one of these guys that believes the media presentation of Trump and his voters. Flake thinks ’cause the media hates Trump that everybody else hates Trump so all he’s gotta do is get on the anti-Trump bandwagon and write that op-ed and he’s gonna be celebrated and hoisted up and applauded, and it’s just the exact opposite. And you know the rest of the Republican Party is watching. RUSH: Cohn and Tillerson are a different matter entirely from Mattis. It’s problematic, folks. I mean, these are key members of the administration, and if they are going to be in open, what would you say, disagreement or defiance, then it’s… I don’t know if it approaches crisis status, but it’s something that’s gonna have to be resolved inside the White House. And it’s all based… We’ve got these stories. What Trump said at Charlottesville as it appeared in the media was made up, was totally made up! And here you have two members of his administration reacting to what the media reported Trump said rather than what the president himself actually did say. Everybody in that town reacts to the media. The media’s got everybody scared to death. So if the media’s jumping all over Trump for being a racist and a sexist and all this, then these guys clearly don’t want to be thought of as that. So they’re gonna do what they can to distance themselves from Trump if the media is saying this. It doesn’t matter whether Trump said it or not. Now, you would think that these guys would be more inclined to go to bat for the president against a lying media. But they may not even know, or didn’t know at the time that that’s what had happened. Who knows! I gotta tell you: I am shocked and stunned every day when I learn that people who I think know more than I do about things are so uninformed about the media and its tactics and it’s day-to-day operation. It shouldn’t surprise me. I think people that interact with them every day ought to know far more than I do how they act and what they do. But they’re all part of the same club, so that speaks a lot.